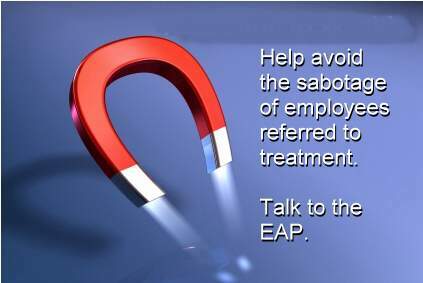 Employee Assistance Programs Blog: America's First and #1 EAP Blog*: After Reasonable Suspicion Training Is Completed, Will Referred Employee Be Sabotaged in Treatment? After Reasonable Suspicion Training Is Completed, Will Referred Employee Be Sabotaged in Treatment? After training managers or supervisors in drug and alcohol awareness, including signs, symptoms, impact, and effect on a worker's psycho-motor skills (all required by the DOT for reasonable suspicion training,) be sure so offer a bit of education to all participants about being careful not sabotage treatment in the event an employee is referred following a positive test and assessment. The sabotage of addicts in treatment is a common dynamic, and demonstrates unfortunately the natural ignorance most persons have about addictive disease and also the powerful bond of enabling as a dynamic that seeks out the addict like a bloodhound with determination to "help" by saying and doing all the wrong things for the right reasons.